KUALA LUMPUR (Dec 8): AllianceDBS Research had maintained its 2016 GDP forecast for Malaysia at 4.1% and expects higher growth of 4.4% in 2017. In an economic focus yesterday, AliianceDBS Research economic team said exports fell 8.6% in October, after a 3.0% contraction in September. 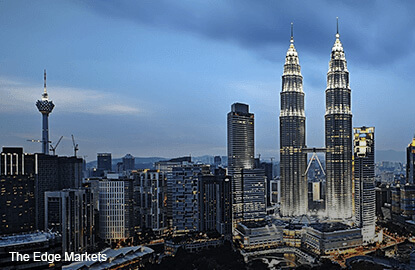 It said Bank Negara Malaysia’s new ruling on repatriation of export proceeds will boost onshore foreign exchange market liquidity but exporters face higher exchange rate risks and hedging costs. Yesterday, the Department of Statistics Malaysia said that in October, exports contracted 8.6% year-on-year, while imports growth fell 6.6%. It said that as both contracted, trade balance remained high at RM9.8 billion during the month versus RM7.6 billion in September. It said the exports decline was led by key commodity exports, namely crude petroleum (-27.9%); refined petroleum product (-1.4%); LNG (-40.2%). Nonetheless, expansion in exports of E&E (+1.2%) and crude palm oil (+0.9%) helped to cushion the drop to a certain extent. Meanwhile, imports growth across the board also registered declines – intermediate goods (-8.9%); consumption goods (-8.0%); capital goods (-2.0%) – during the month.